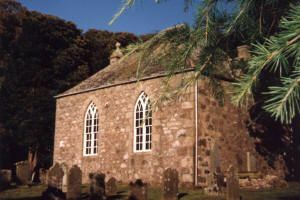 Bourtie Kirk has a tradition of over 800 years of Christian worship. It lies in the midst of Aberdeenshire fields at Kirkton of Bourtie, over Barra hill from Oldmeldrum. Bourtie Kirk - 800 Years by Marian Youngblood, ISBN 09526 3652-2 published by Cleopas Publications, Inverurie AB51 0JS Scotland. A fairly traditional service is held at Bourtie Kirk on the 1st and 3rd Sundays of each month unless otherwise intimated. It attracts a small but faithful congregation (of about 12 in number) on each occasion. Additional special services are also held including the popular Carol Service followed by Christmas mince pies and mulled wine, and the Agriculture Theme Service held every second year, followed by a barbecue in the adjacent field with local farmers showing the children their tractors and produce.